I picked the above graphic as one out of many interesting statistics in the PEW survey on public opinion polls in muslim countries. 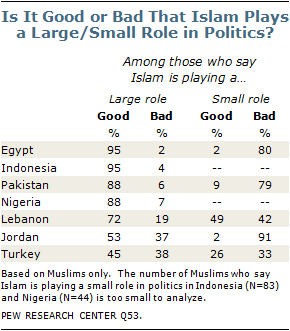 It is of course interesting to see, that of all the millions of egyptian protesters only some 2 percent found it "bad" that Islam plays such a large role in Egyptian politics. Had it been fewer, it would have been a segment of the population "too small to analyze". But let´s hope that these 2 percent of Egyptian secularists by the use of Facebook and twitter will be able to convince the remaining 95 percent.